Sookie Stackhouse enjoys her life, mostly. She's a great cocktail waitress in a fun bar; she has a love life, albeit a bit complicated, and most people have come to terms with her telepathy. The problem is, Sookie wants a quiet life - but things just seem to happen to her and her friends. Now her brother Jason's eyes are starting to change: he's about to turn into a were-panther for the first time. She can deal with that, but her normal sisterly concern turns to cold fear when a sniper sets his deadly sights on the local changeling population. She's afraid not just because Jason's at risk, but because his new were-brethren suspect Jason may be the shooter. I love the Sookie Stackhouse Series! 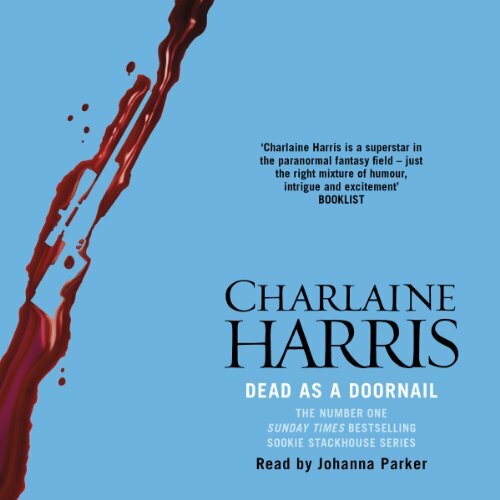 I love everything Charlaine Harris does and this is no exception! What a great listen! Thoroughly enjoyable and of course snaps to the narrator who, as always, does a fantastic job! This series is my favorite of my books. It keeps you wanting more and more. A definite must read for all Vampire fans. Just excellent and the Narrator is excellent. This is a solid continuation of the Sookie Stackhouse story - although not my favourite. It still had me listening almost continuously & I find these stories are so much more satisfying than others of the genre. Johanna Parker's narration is a real treat too. I think I could listen to her read a shopping list. Great book, sorry about the narrator. Would you listen to Dead as a Doornail again? Why? I like Erik - and Sookie of course. She has the WORST accent and just ruins the book entirely! She isn't a bad narrator but she cannot do mens voices and accents! Yes I got mad and turned it off. I have the written books, thought the audiobook would be great for bed time - but the narrator turned me off it completely. I will read the darned things myself!